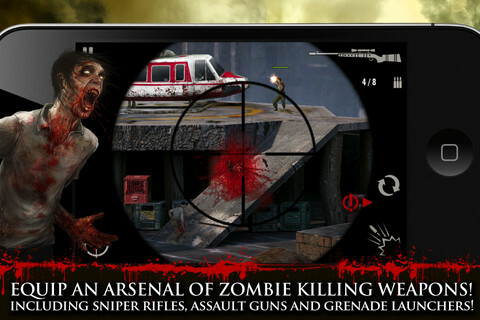 Contract Killer: Zombies is a gory 3D freemium game from Glu, the makers of Gangsta, Glyder and countless other high quality mobile games. It’s also sadly obsessed with trying to make you spend money. In the game, the sequel to Contract Killer, you watch your companion, Evelyn, as she runs around looting shops and picking up survivors of the recent zombie infestation. You need to protect Evelyn and company as they are attacked by swarms of hungry, brain-gobbling zombies, shooting them down with a variety of weapons. So far, so good. But then ‘freemium’ kicks in. Levels get progressively harder as you journey through the game, as is to be expected – and to combat the higher difficulty, you need better weaponry. But weaponry can only be bought in the in-game store, either with the money that you’ve earnt in-game or that you’ve bought for real. Fair enough, except that it takes far longer to accumulate money in-game than it does for the difficulty to increase. Hence, if you don’t want to spend your actual money on the game, you’ll be stuck. And to rub it in, every time you fail a level, you’ll be told you should “purchase a better weapon in the store”. Similarly, every time that you unlock a new gun, you can’t carry on playing the game until you’ve looked at it in the shop – together with the big ‘buy’ button right next to it. Normally followed by a mental ‘only $10000? Oh good, it’s just a shame I earn about $400 per level’. Besides my issues with the implementations of the freemium model, I couldn’t find any other major faults with Contract Killer: Zombies; my largest other gripe is the lack of a retry button in the pause menu, and that’s a pretty small problem. The bloody graphics are a little chunky but otherwise look good, and sound effects are both useful and handy; when a human’s being attacked, they cry out for help, so you know to frantically hunt them down and rescue them from their immediate attackers. The controls work well too. You swipe to move the camera, and tap a button on the bottom right of the screen to shoot. Switching weapons is done via a small button above the shoot button, and a scope symbol at the bottom left of the screen zooms the camera inwards so that you can aim more precisely. Overall, Contract Killer: Zombies is a well constructed game that’s somewhat spoilt by its innate focus on making money. Of course, all apps are intended to be profitable – but when that aim leaks out of every pore of a game, it stands in the way of the experience. My problem here isn’t that you need to spend money on the game; I think the game is worth paying for. What I find so frustrating is the way that the game so overtly tries to persuade you to pay your way through it at every opportunity. Still, the game itself has a lot going for it and as such is worth trying, especially since it’s free – to begin with, at least. Looks good, but a shame about the in app purchases. Really wish devs would give an option of just buying a full game.